Nonna is frail at the moment and feeling the cold. I’ve put aside my other crafty endeavours to crochet a neck-warmer for her. She already has a hot-pink one that I made her several years ago, but it has seen lots of use and is not as fresh and cosy as it once was. Enter the Moda Vera Ambruni white yarn, leftovers from Youngest Niece’s birthday present, and the demonstration moebius cowl I worked on with Colleague DS the other week. She’s making progress with hers, but has decided that, much as she loves to wear black, it’s too hard to work with. She’s changed to a grey instead. I know that Nonna would prefer something other than white (the hot-pink was a winner), but white is what I have so it will have to do for now. It works up nicely and the end results will be soft and warm. I took a photo – not exciting, of course, but a photo – only we are having major technical problems (again!) so at this stage, I can’t share it. But, honest, I’ve done about six inches already. And isn’t it keeping my fingers warn on this very chilly day? I work for an organisation that helps people who look after other people. Some of my fellow workers are themselves carers and, although there have been tough times with YoungB, I know I’ve had it easy. Odd as it might sound, and this is not entirely age related, I’ve found fellow knitters, sewists, crocheters and crafters among my colleagues. Many admit to using such things to counter work-related stress. Colleague DS is about my age with sons around YoungB’s age. We share a star sign and a similarity with a couple of major life events. Things are in severe upheaval at work, with packing the second part of our office making steady progress while the first half are unpacked and already settled in their new premises. We’re all busy, it’s winter and sometimes just putting one foot in front of the other is almost more effort than we can manage. I was humbled and gobsmacked when CDS presented me with a thoughtful little, handmade-by-herself gift of a necklace and a handbag pack for tissues (always welcome, because I’m so prone to allergic reactions to pretty much everything that I can never have too many tissues). CDS says that her crafting days are what keep her sane through the struggles of raising her special needs son. I understand that. I used to knit while YoungB had swimming instruction in a pool specially for asthmatics (no entry without medical certificate). Tomorrow I’m taking a crochet hook and some yarn. During our lunch break, I’ll show her how I do the Moebius cowls, and she can then share that with her fellow crafters at the next session. I might now be one of the privileged, whose son is apparently normal and certainly doesn’t qualify as special needs, but I appreciate how easily my situation could be very different and if I can share something to help with the tough moments, then that’s a fine contribution to the caring. The internet has corrupted me. I would never have paid so much money for yarn until I saw some end results on all those fabulous websites. In the days when my disposable income was more mine and less everyone else’s I did buy good yarn, but it was almost exclusively wool with occasional blends that contained predominantly wool. Now, I’ve been sucked in by some fabulous mixes and, oh rapture (or should that be oh horror? ), I’ve succumbed to Noro’s Silk Garden (Ravelry link). Sure, it’s to make a special scarf for a special birthday but nearly $60 for just FOUR skeins of yarn that contain only 10% wool? Wow. 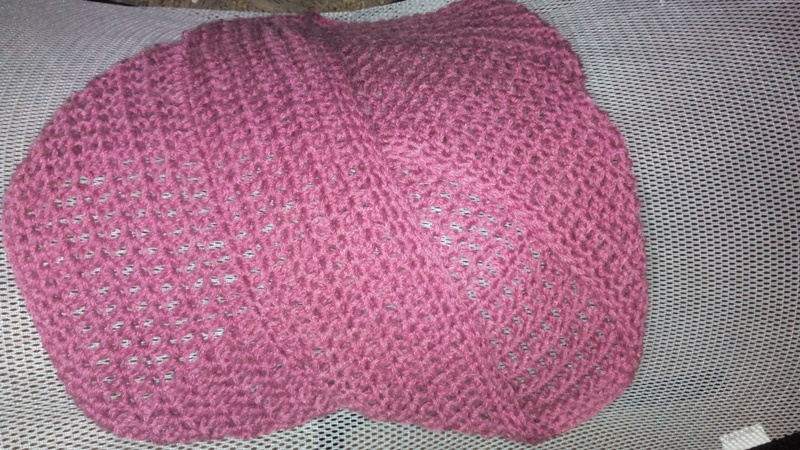 The Moebius cowl I crocheted for a friend earlier this year cost $20. That used two skeins of what I seem to recall was a wool/alpaca mix (it wasn’t pure wool but I’m afraid the details escape me now). I thought that was expensive, and by my standards it was, though I didn’t for a minute grudge either the cost or the time it took to make, but I did reflect that it was one of the dearer small garments I’d made. (I would naturally expect to pay more than that if I were knitting a jumper.) It was probably also a softer finish than many of the garments I make for us. I use wool for the majority of my knitting with occasional ventures into acrylic/retrieved fibre mixes depending on end-use intention (Boy’s tencel beanie springs to mind). Perhaps being raised on a farm has made me a dedicated wool user but I find it’s usually the best option. The softness of Silk Garden, even in the making, is converting me to the notion that there are other sources of softness. I’m using it to knit a scarf for Eldest Son. It’s scary to contemplate that he’ll soon be 40. He was complaining recently, as he stood about three inches away from the fire and politely said, “No!” each time Dr B suggested doing PBP on a tandem, that he was cold. Poor old thing. If he’s cold, a scarf is the answer. Right? Well, maybe. In any case, I’ve bought that fabulous yarn and I’m doing a simple 1 x 1 rib in a two-row stripe, letting the colour do all the work for me (not a new idea and one I’ve used previously on a beanie for Dr B). I’m not entirely convinced about the green bits, in the sense that perhaps Eldest Son isn’t as enamoured of green as I am, but in the overall mix it’s probably going to be all right. Boy thinks what I’ve knitted so far looks nice although he can’t be depended upon for good colour recognition when there are stripes. For that matter, neither can I sometimes! For starters yes, I am mildly acritochromic. Add to that, I often knit at night in soft light. So, not surprisingly, I recently reached a spot where I wasn’t sure what colour I was seeing. I knew it had been a dark olive green and was fairly sure it still was. Everything was looking fairly grey to me, though, so I wouldn’t have put money on the green. I didn’t know whether the problem was my dodgy colour vision or the dodgy light. The following morning, when I was knitting on the bus with strong daylight to aid me, I discovered that what had seemed grey was, in fact, grey. Ah. There’s another of the joys of Silk Garden: some unexpected colours. So it’s not just that the web has corrupted me, my colour vision has also corrupted my ability to tell what I’m doing! I’m definitely buying more Silk Garden though, corrupt or not, and hang the expense. It’s beautiful to work with and for special birthdays? Yes, definitely an affordable luxury. I’ve already outlined the first few days of wearing scarves/cowls. Here’s the rest of how I managed to wear me-made during May, although not to any great extent, certainly rarely with anything approaching styling and equally certainly with much repetition; to the point of boredom, really! Saturday, 5/5: Triangular neck warmer with weekend clothes. Sunday, 6/5: Green and blue scarf, with blue jumper over white T-shirt, blue trousers and green jacket. You’d think I must have been going somewhere to get that dressed up, and so I was. Youngest Aunt and I attended a matinee performance of The Merry Widow, which we thoroughly enjoyed. And on the subject of me-made, Youngest Aunt was wearing a little knitted scarf that I made for her birthday the year before last. Tuesday, 8/5: A by-design casual day at home/out and about, which was unexpectedly warm; so the dodgy Portia top with blue trousers and cardigan fitted the bill no probs. Wednesday, 9/5: Once again, the blue/green scarf with grey trousers and houndstooth/grey jacket. OK for court; and sorry about the poor photography, but you can see the scarf. I should add that I have a shorter scarf I made from the same fabric about four years ago and I wear that quite often during summer, as it’s short and more decorative than truly functional. Thursday,10/5: black and white scarf with black trousers, jacket and shoes, and white stretchy top. OK for court, though the matter didn’t proceed. Photographed on phone. Crappy pic, to be sure; I must have been feeling extraordinarily browned off when I took it! Changed to colourful scrappy crocheted Moebius when I came home (because I needed extra warmth). OK, I match the decor. Can I go home now? Friday, 11/5: I knew I’d be in court again and that the weather was meant to be slightly warm. I couldn’t decide what to wear but knew the choice would be between blue or blue of some shade with, well, I wasn’t quite sure what! It was blue trousers, once again with the blue/green scarf and the grey sports jacket. Saturday, 12/5: At home, keeping warm while working in the sewing room for much of the day. Blue bootleg stretch trousers, blue polo-style top and cardigan with the scrappy, crocheted Moebius cowl. Sunday, 13/5: As it was Mother’s Day and we were having cake and coffee with the nonni, I wore the triangular neckwarmer with yesterday’s trousers and the grey sports jacket. Yeah, I think I need some new clothes! I ended up putting on my old teal lattice jumper (very old; I knitted it in 1984) because I was simply cold and the made-for-me-by-my-Mum shawl, while lovely and warm, was too awkward for work. Monday, 14/5: The eight-foot-long, knitted side-to-side, three-coloured, linen-stitch scarf, complete with tassels, made its first outing today. I rationalised that I couldn’t really give away something with mistakes in it but I’m sure I could have! Heck, I know the mistakes are there and I can’t see them (not without searching, anyway). I had several comments on how nice the scarf is and how thick and warm it looks. It’s certainly thick and it’s certainly warm, which was a great thing when I was walking home from the bus tonight. The colours are pretty and I took a photo on my phone to prove that I actually wore it. Not that I know how to get photos off the phone and onto my computer, but we’ll deal with that another day. It really is a lovely thick and warm scarf, and my colleague loves it! Tuesday, 15/5: So I gave away that scarf, although I wore it to work and out at lunchtime and had put it on to come home again when one of my colleagues, whose elderly mother is presently quite poorly, mentioned how nice it was and I thought, “Well, she’ll probably love it and the colours would suit her,” so I whipped it off and presented it to her, all 75 feet of it including mistakes, as I pointed out! That is, I pointed out that there were mistakes. I didn’t actually point out the mistakes, as I’d have had to have searched to find them. I can knit another such scarf and perhaps make it shorter and wider. Just not tonight, that’s all. Tomorrow, then, I reckoned I’d be back to my old green scarf or the scrappy, crocheted Moebius cowl, as the weather was decidedly too cold for chiffon fabric scarves. Either that, or I’d have to knit all night and finish off my Stephanie shawlette, which is made with a lovely soft acrylic in a very pretty blue. I pulled it out of the knitting box to check its progress. No, it’s too short and I have to unpick some of what is there because of a very obvious mistake (if not two of them). The trouble is that, being of my own reckoning as it is, I haven’t written down what I was doing, so it might take me a little while to work out the pattern in any case. I keep miscounting the yarnovers, that’s the main problem. In any case, it was clearly not an option for work. Wednesday, 16/5: It was the Moebius cowl to the fore today. The morning was unfriendly. Boy wore his blazer to school because he was so cold! Thursday, 17/5: Moebius cowl again (excuse my messy background in the above pic, but it’s better of the cowl than the one I took at work). Friday, 18/5: A new crocheted Moebius cowl. Yeah, yeah, I know – but it took me only a couple of hours to make and it uses up scraps of yarn that aren’t enough to do anything serious with when looked at individually. Put together? Ah, that’s what scraps are for. Besides, the one I’d worn on Thursday had a pleasant enough aroma of massage oil (post physio appointment) but I didn’t want to be carrying that around with me. Plus, I needed something a bit fancier for an evening outing. Saturday, 19/5: the new Moebius cowl. I was cold! Sunday, 20/5: the new Moebius cowl again because I couldn’t be bothered looking for anything else. I washed the original. Monday, 21/5: With the descent to winter weather, it’s hard to get enthused about anything other than woolly scarves or neck warmers. I wore the older Moebius cowl, which garnered compliments for its lovely colours. Tuesday, 22/5: Variety – not! – with the newer Moebius cowl, which won accolades from a serious sewist colleague. She recently purchased a dress form to replace one that a so-called friend had broken, and remembers getting her new sewing machine back in the 1970s and feeling as excited about it as if she’d got a new motor car. I recognise that feeling. I shared it when my Mum’s new sewing machine arrived (and it promptly fell to Middle Aunt and me to start sewing on it). It’s the one I’m still using. Middle Aunt now has a newer one which she has used, in combination with her overlocker (purchased for her by Grandpa) to create clothes for all her children and herself quite a lot over the years. She does less sewing these days, being much too busy working and helping run the family business. We exchange notes occasionally, though. Wednesday, 23/5: What possessed me I can’t say but I wore my little green/blue silky scarf with my grey sports jacket, blue trousers and long-sleeved T. Did I freeze? Only not quite but darn, it was close. Mind you, I had my older Moebius cowl with me as well as a balaclava! When Dr B and I ducked into the shops on our way home, I popped the cowl round my neck. The balaclava, however, I left in the bag. Its time will come. What’s really coming, I have to admit, is overcoat weather. Thursday, 24/5: The black-and-white scarf garnered praise from my serious-sewist colleague today. But I had my Moebius cowl with me, the older, longer one. I needed it. Apparently today was our coldest May day in 25 years. It was darn chilly, I can’t argue with that. And work being particularly horrid, as it was, I appreciated the hot pack that the physio placed on my neck to help with all the stiffness and pain. It helped combat the cold too. Friday, 25/5: Today I dragged out my big square of heavy crepe. It’s not really square and I’m not sure if it’s crepe but it’s a crepey style of fabric, to my eye. I’ve had it for a very long time. I bought the remnant well before Boy was thought of, and I would suppose I had something in mind for it at the time. History does not record what that might have been! I decided a few years ago to rescue it from obscurity by overlocking a rolled hem and calling it a big scarf. It’s good because it’s big and a reasonable weight, so I can almost make it double as a lightweight shawl. I like its autumn tonings. Saturday, 26/5: I wore the same scarf/shawl as yesterday, tucked into my old orange cardigan; not exactly a culture clash but not quite the same shades. It looked all right on a Skype call, anyway, so no complaints. Sunday, 27/5: I just couldn’t be bothered today though I ended up with one of the cowls for a while late in the day when I suddenly became rather cold. Monday, 28/5: Out came the shorter crocheted Moebius cowl again, though not all day. Tuesday, 29/5: My old green garter-stitch scarf came out to play today. It’s something I knitted to occupy me while Boy was having swimming lessons when he was quite young. It’s functional and I like the colour though it really doesn’t look quite right with the duffel coat, which is a different sort of green! I didn’t take a photo and could only find one old photo where it sneaked into the shot but not in any meaningful way. So, you know, it’s just green and plain and long enough without being too long. Thursday, 31/5: I was at home with a respiratory unwellness (I had to get out of bed and dress because I was coughing too much lying down, there is no justice in life I tell ya) and simply could not be bothered trying to find a me-made anything to wear. I washed two me-made beanies (they’re Dr B’s, though I’m thinking I might appropriate one now that mine has gone to Nonno and, really, Dr B doesn’t need two practically identical beanies – both dark red, knitted to the same broken-rib pattern – does he? ), the triangular neck cosy and the shorter Moebius cowl, since I was at home and they needed a wash and the weather was almost cooperative, so maybe that counts? I wasn’t an official participant, I know, and it’s probably true that dragging out some bit of me-made neckwear is not really a challenge, but I almost managed Me-Made-May. Were it a summer event, I could probably do it with tops (two Portia tops at least plus one or two others that are lurking about the place). I might have to make a more concerted effort in December, say, when I’d be in a with a chance of achieving more meaningful sewing and wearing things I already have in my wardrobe. Sure, I would once have breezed through May in handknits. But not any more. If you participated, how did you go? you know how I hate technology? I’m not entirely averse to technology nor entirely incompetent at driving it (obviously, or I wouldn’t spend hours of my day using a computer). I have basic uses for phones, however, and the idea that I’m now going to be landed with a smart phone that nobody else wants is simply irritating. I don’t want a smart phone. I just want the mobile phone that I already have to work better. It won’t, because it’s reasonably elderly (as mobile phones go) and its technology is failing. Watch this space. In the clothing arena, I’ve managed to wear something me-made each day. Yesterday and today it was my own scrappy three-coloured crocheted Moebius cowl. The weather was cold, the cowl is warm and the colours are pretty. But I have discovered that generosity has its drawbacks because, having given away some of my own warm accessories (fingerless mitts, beanie) to those whose need was greater, I’m now without any. R-i-g-h-t. I have a balaclava that I can use as a beanie (and have, in fact, used that way for many years). It’s not quite the same as a real beanie, though, so I might now have to make another beanie. For me! Will it be the Inca L574 or the broken rib one from the defunct women’s magazine? Decisions, decisions. The deciding factor is likely to be what yarn I have in my stash. The pink L574 beanie I sent off with Boy for him to give to his girlfriend who’s been in hospital and is still unwell. I thought she could at least have a nice, warm head while she was convalescing. I’ve bought yarn (Cleckheaton Country Tartan 8 ply) for Youngest Uncle’s fingerless gloves. And, oh, he does actually want fingerless gloves not fingerless mitts. I offered, so I’ll do it, but it’s a good thing I have till September to make them. Part of the attraction of fingerless mitts is that they’re easy. Fingers, even truncated ones? Yeah, right. More learning (yes, I have made gloves in the past; just one pair and I’ve no intention of admitting how long they took). In any case, conquering fingers might be easier than conquering the technology associated with the smart phone! Middle Aunt asked me to pick up some new curtains for Eldest Nephew. I didn’t have a car available to me so off I went on the bus, in the rain. I had to scramble around on the floor to find what she’d asked for, because with the sales nearing their end the selection was narrowing, but find them I did. We have now only to arrange the collection/exchange of the curtains, two knitted beanies and a crocheted Moebius cowl.